OK, we’re tired of rain. And we weren’t even here for last week’s gully washer. The following week is a travel week. We’ll wait until the rain subsides tomorrow before pulling up stakes to leave. We’re only going as far as Atlanta tomorrow (Stone Mountain), so only a 3 hour trek at best. We did a little more trailer decorating today. Val had been wanting some better place to stick magnets than the cool boards we made for the refrigerator. The magnetic paint was OK, but for heavier magnets and weaker magnets, things just weren’t working out well. It has a weak attraction. After deciding that a piece of metal would work, we set out to find something suitable. Turns out that replica tin signs are just the ticket. This one we hung next to the kitchen slide to put magnets on. We initially thought about turning it around so that the back was showing, but thought the saying was neat. 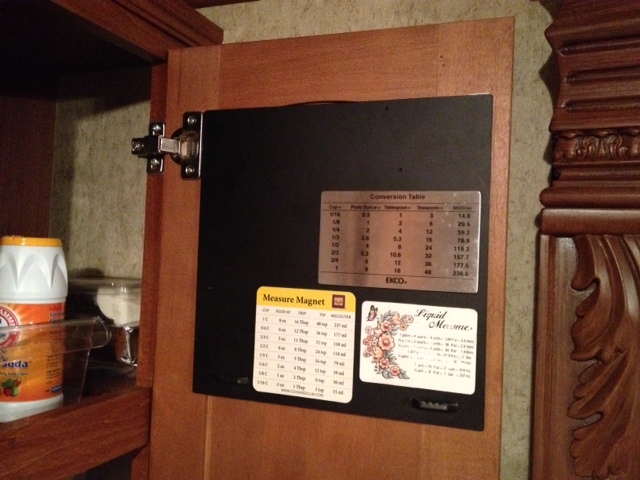 Val wanted a smallish board inside the kitchen cabinet to put some magnets she has with various measurement conversions and such. We found the perfect one for that and this time used the back side of the sign, since it was painted black. Small sign reversed inside cabinet. In both cases, we used Command Strips to hang the signs. Both signs were purchased at JoAnn Fabrics and happened to be on sale. One thing we had been looking for is a better collage picture frame than one we had originally bought. The original one didn’t have enough sturdy, flat area on the back to mount command strips on, so we tried using a hanger instead. That didn’t work out too well. The new frame is on the top-left. Below it is a frame with three pictures we had taken at Disney World. These all hang on the bedroom wall. Again, Command Strips hold everything up. 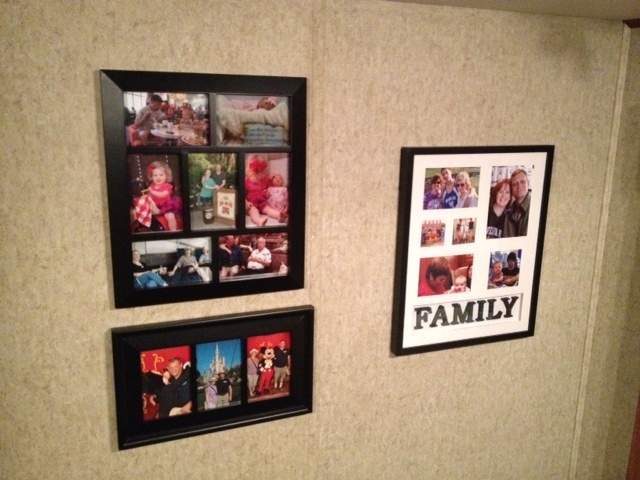 New picture frames (two on the left). A neat find at Costco this evening, just browsing around the store. 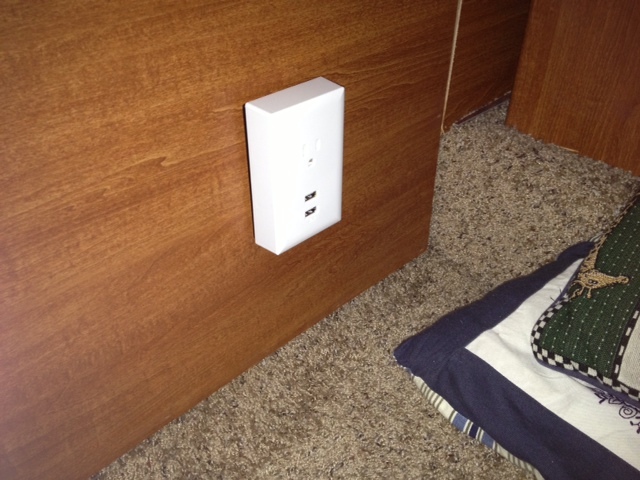 This packaged set of two outlet covers with built-in USB ports. 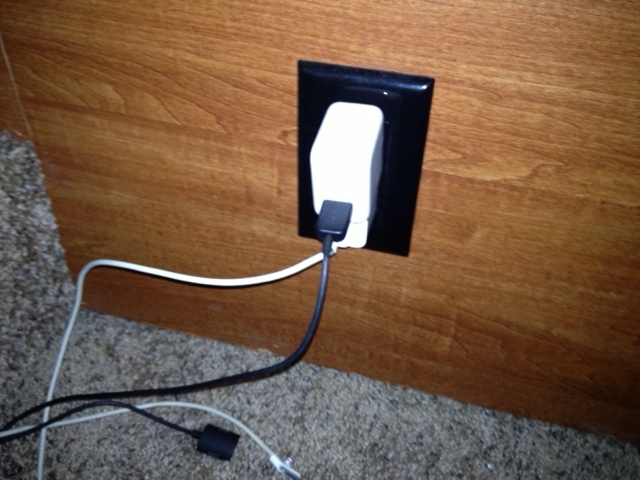 They plug right into the existing duplex AC outlet and free up a plug as well as allow you to charge two devices. The bottom USB plug is a high-output one designed for iPads and such. 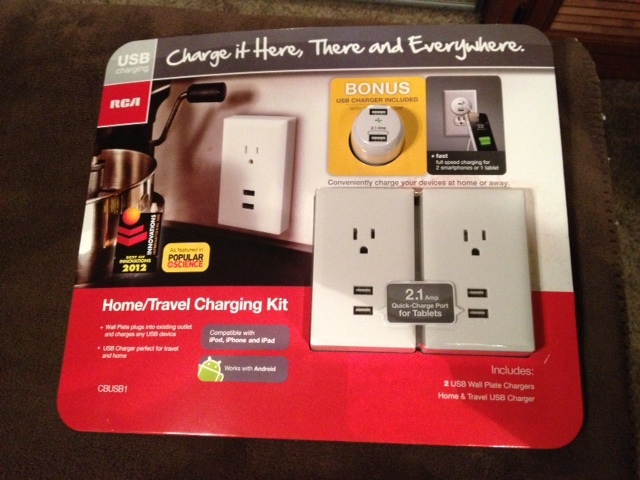 A bonus plug in charger was included (for travel, I presume). The set was $24.99. Current setup on side of bed frame. Tomorrow, Malcolm is going to have an LP tank filled at the farm supply place up the road, then take the truck down to get the fuel filter replaced. Hopefully the rain will subside by noon so we can pull up stakes without getting soaked and head towards Atlanta. 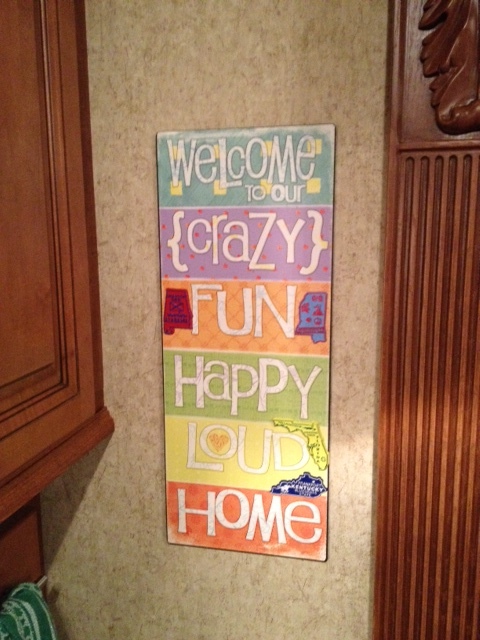 This entry was posted in Alabama, Home, modifications. Bookmark the permalink.